The newest tech fad snatched up $14 million in funding, and its backers say is going to change the way people use the internet forever. The new app lets users stream and share videos in real time and automatically sends them to Twitter. “We are all about re-inventing shared experiences,” the company says on its website. 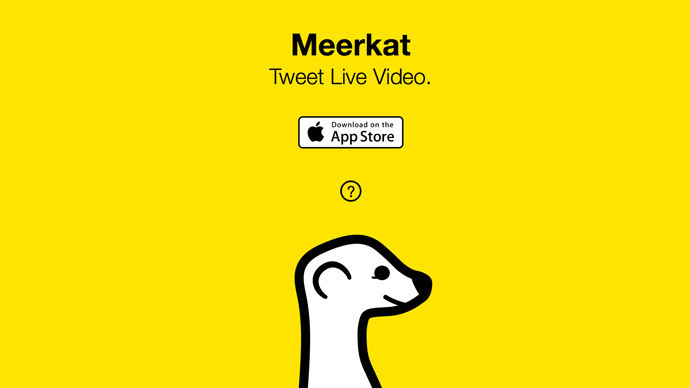 Meerkat is expected to be used for on the ground reporting, as well as socially, between friends to share personal moments. The platform has more than 120,000 users and is one of the fastest growing social apps. Introduced last February by San Francisco-based Life on Air, the live streaming service is already in the top 25 social networking downloads in Apple’s App Store, according to App Annie, which tracks application metrics. Like Snapchat, content is only available in real time- no reruns. Each user’s content will be saved to his/her device, but not on a general cloud. Snapchat, which is only four years old, values itself at $19 billion. The company is rumored to be considering an IPO. 27-yeard old Ben Rubin, Meerkat’s chief executive officer, uploaded his own video on Thursday March 26 to announce the $14 million in funding. Investors include Chad Hurley, co-founder of YouTube and Hollywood actor Jared Leto. Financing was led by Greylock Partners. The app is competing head to head with Twitter-backed Periscope, which is similar to Meerkat, but has the advantage of tapping into Twitter’s data. Twitter went public in a $1 billion IPO in October 2013.